The I’m A Celebrity campmates lost a huge four stone between them during their stint in the jungle. And actress Emily Atack, 28, who came second on the show, took to Instagram on Thursday to share an impassioned post about learning to love her body. Sharing a bikini picture of herself taken just before she went into the jungle, Emily vowed to celebrate her body and vowed never again to use slimming apps. She wrote: ‘Morning mud crabs. just catching up on everything. I am back in London! Can’t believe the amount of articles & comments about my bod. ‘Some good, some bad. I will never EVER use a Slimming App ever again. We are all different shapes & sizes. We are all unique. 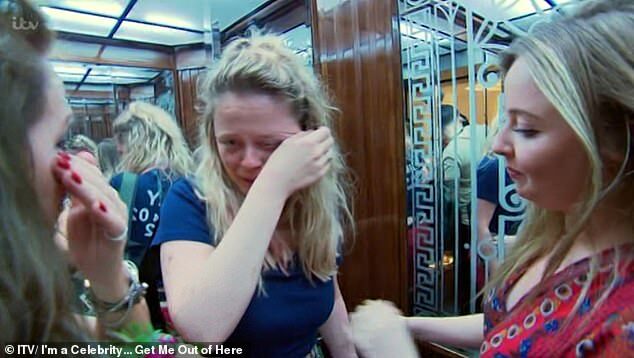 Going onto the show has clearly been a special experience for Inbetweeners actress Emily who cried when she left the show, after saying she had gained confidence. She said: ‘I came into this not with a difficult start to the year. I didn’t know what I was doing. I have so much self acceptance. ‘I worry about things constantly at home. I realise I don’t have to do that.I will never doubt myself again. I can survive in the jungle so now I can do anything. Emily has been through the mill of late. She split from her boyfriend Jack Vacher within weeks of her uncle passing away. The star was also accused of having a 2016 fling with comedian Seann Walsh, who was in a relationship with girlfriend Rebecca Humphries at the time. The news broke after he was caught kissing his married Strictly professional partner Katya Jones, in October, on Rebecca’s birthday. She dumped him and took the cat.